Khimsa Glacier is a rare significant glacier south of the main crest of the Caucasus Mountains in Georgia. The glacier drains north to the Bzyb River, and then the Black Sea. The rivers upper reach is quite undeveloped and there is no hydropower along the river to date. 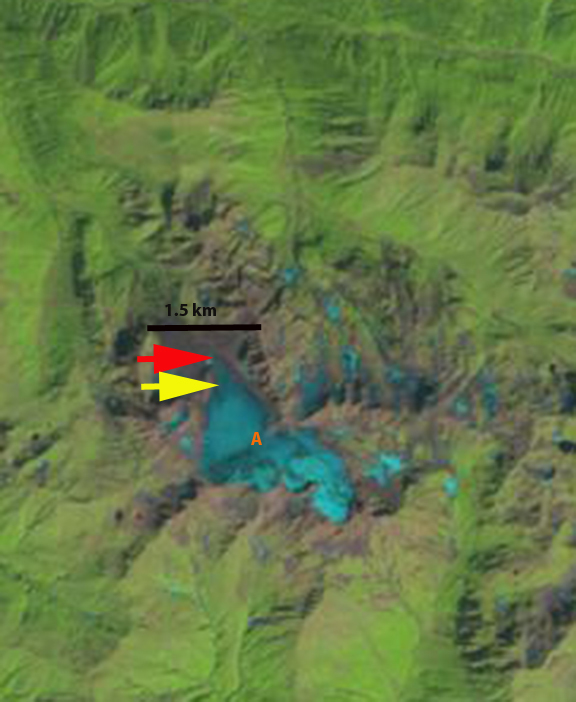 The glacier flows from an elevation of 3000 m to 2650 m. In 1998 the glacier was 1.6 km long with a narrow terminus at the red arrow. At the transition to the glacier’s upper eastern slopes at Point A, there is only one small rock exposure. 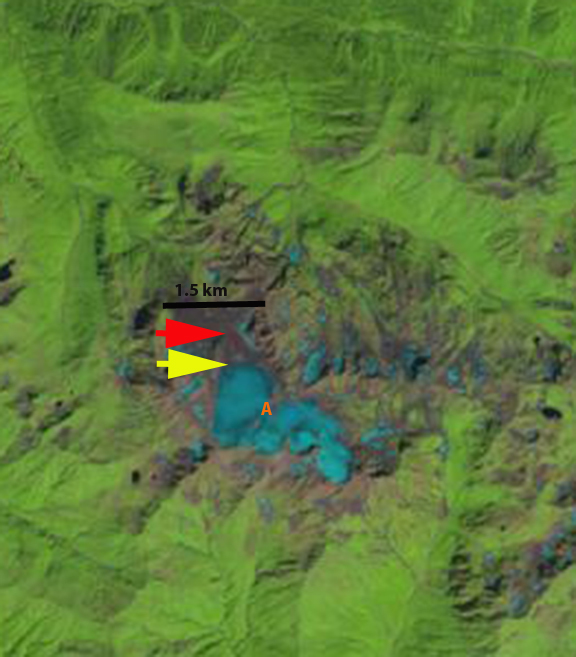 By 2013 the glacier has retreated 400 m to the yellow arrow, having lost 25% of its length in 15 years. The area of bedrock exposed on the upper eastern slope, at Point A, is significant now indicating thinning even high on the glacier. The glacier will soon separate near Point A into an upper and a lower section. 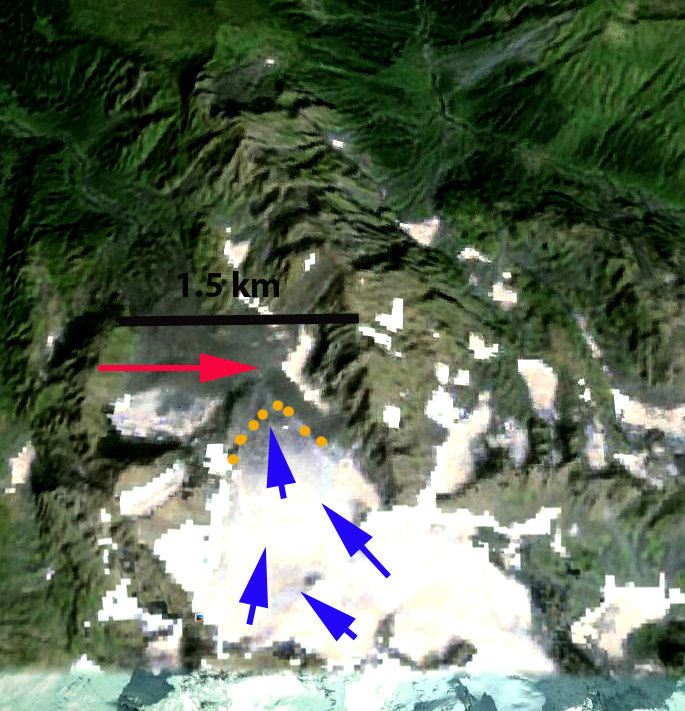 In the Google Earth image the current terminus is indicated with orange dots and the glacier flow with blue arrows. Like Psysh Mountain glaciers 25 km north Khimsa Glacier thinning high on the glacier indicates it cannot survive current climate. Caucasus Mountain glaciers are in a period of rapid retreat (Shagedenova et al, 2009), that is attributed mainly to rising summer temperatures. Khimsa Glacier’s retreat parallels that of glaciers along the main crest of the Caucasus such as Kirtisho or Azau Glacier, though as a percent of total area lost it is greater. This entry was posted in Glacier Observations and tagged black sea watershed glacier retreat, bzyb river glacier retreat, Caucasus glacier retreat, georgia glacier retreat. Bookmark the permalink.